It’s NOT about transmitting information. Workforce communication is listening to people and using key principles to grab attention, inspire trust, and nudge behaviors of people to deliver results that matter … all within the crazy complexities of a human organization. Learning and practicing the principles of effective communication can help you become a better leader, a more successful businessperson, and maybe even a better person overall. Workforce communication is a specialized focus within corporate communication. Corporate communication, according to Wikipedia, involves managing and orchestrating all internal and external communications aimed at creating a favorable point of view among stakeholders on which the company depends. Workforce communication, according to us, involves mostly internal stakeholders (such as employees, front-line managers, leaders, executives, board members, and their families and communities) and is aimed at engaging people, inspiring trust, and driving action to support well-being and business performance. 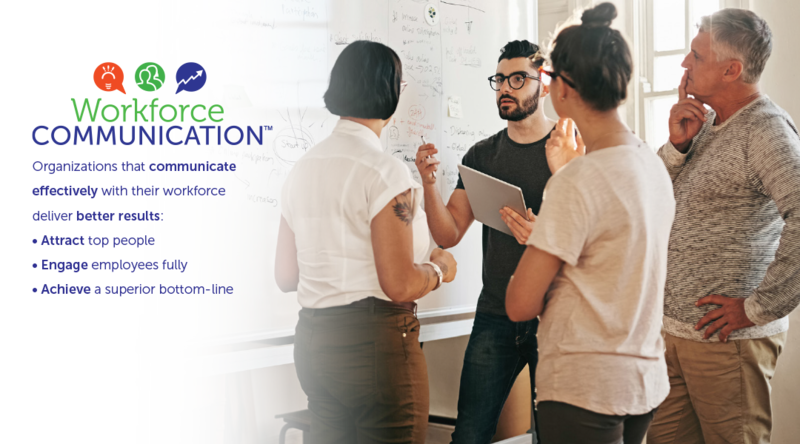 Our company, Workforce Communication, is a team of consultants and creatives using the power of communication to help organizations make a difference in the well-being and performance of their people. We’re all about engaging people, inspiring trust, and driving action. Along with Jesse, Laurie Barnes is a co-founder of Workforce Communication. With more than 30 years in the biz, Laurie is a successful communication executive who is known for out-of-the-box thinking. She has held leadership positions at three large, global consultancies — Willis Towers Watson, Deloitte, and Mercer. In 2010, Laurie formed Maple Tree Lab, a communication boutique. At Workforce Communication, she serves as a talent leader inside the firm and a creative strategist for clients.